A personal and insightful call to action and a much-needed book about one of the most important bilateral relationships in the world—the relationship between Canada and the US—and why diplomacy matters now more than ever before. All over the world, diplomacy is under threat. Diplomats used to handle sensitive international negotiations, but increasingly, incendiary Tweets and bombastic public statements are posing a threat to foreign relations. 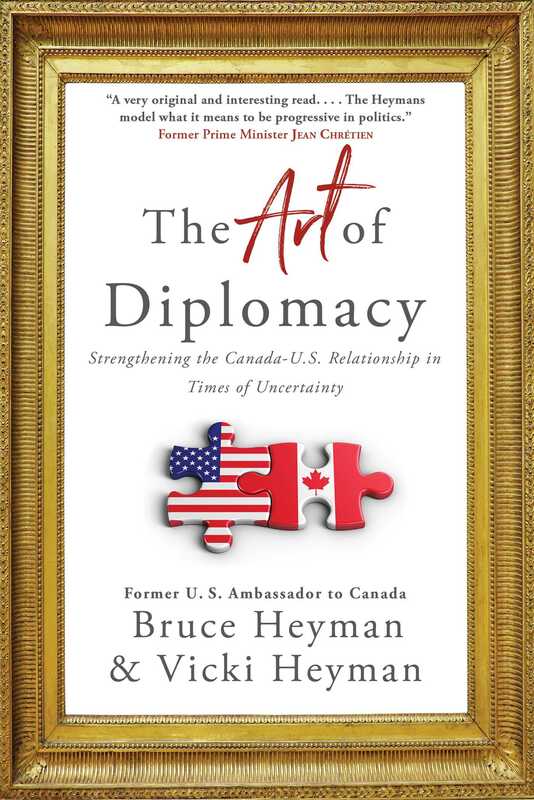 In The Art of Diplomacy, the former US ambassador to Canada, Bruce Heyman, and his partner, Vicki Heyman, spell out why diplomacy and diplomats matter, especially in today’s turbulent times. This dynamic power couple arrived in Canada intent on representing American interests, but they quickly learned that to do so meant representing the shared interests of all citizens—no matter what side of the 49th parallel they happened to live on. Bruce and Vicki narrate their three years in Canada spent journeying across the country and meeting Canadians from all walks of life—including Supreme Court justices, prime ministers, fishermen, farmers, artists, and entrepreneurs. They tell the behind-the-scenes stories of how their team helped bring Obama to Canada and Trudeau to the US. They also reveal the importance of creating cultural and artistic exchange between Canada and the US, of promoting economic and trade interests, and overall, of making a lasting positive impact on one of the most important relationships in the free world today. This politically poignant and heartfelt memoir is a call to action, a reminder that only by working together to protect our shared values—the environment, social justice and human rights—can nations build a better world for all. As their long-time friend and colleague President Obama once said, “The world needs more Canada.” At this key moment in history, when opposing nationalist and populist agendas threaten to divide us, The Art of Diplomacy reminds us to keep calm, to work together and to carry on. Ambassador Bruce Heyman served as the United States Ambassador to Canada under President Barack Obama from 2014 until 2017. He appears regularly on CBC, Fox Business, Bloomberg, CTV, CNBC, and other media outlets as an expert on trade and bilateral issues. He lives in Chicago with his wife and co-author, Vicki Heyman. Connect on Twitter @BruceAHeyman. Vicki Heyman was an American cultural envoy in Canada, leading cross-border conversations and programs related to the arts, social innovation, and youth engagement. She is on the board of the Council for Canadian American Relations, the international advisory board of C2 Montreal, and Chicago Media Project. Vicki lives in Chicago where she and Bruce are co-founders of Uncharted,llc. Connect on Twitter @vshey. “A very original and interesting read about partnership and the important relationship between Canada and the U.S. The Heymans model what it means to be progressive in politics." “A fascinating glimpse into how personal relations in diplomacy can leverage national and common interests. . . . The Heymans arrived in Canada as unknown guests but left as great friends of our city, country and most importantly, our citizens." – Bob Rae, former Premier of Ontario and bestselling author of What’s Happened to Politics?